Want ideas for a masculine kitchen? Here are awesome 3D visualizations for you. 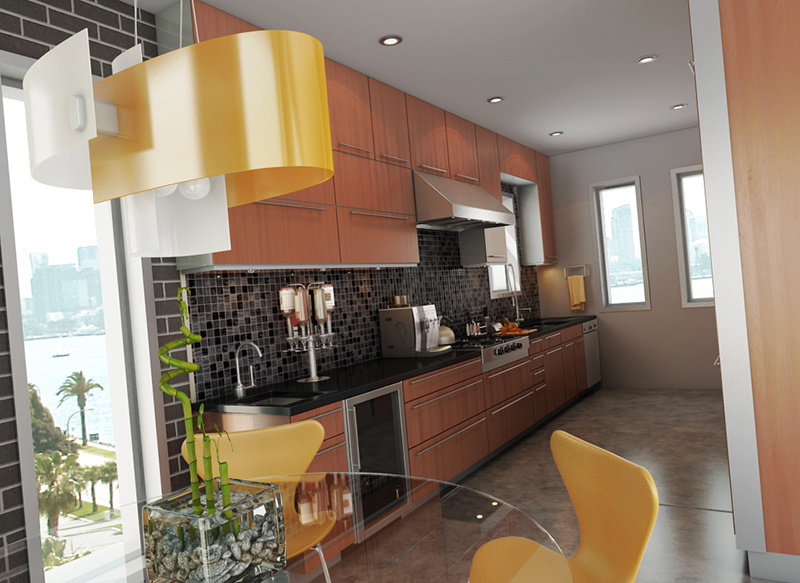 It is indeed impressive that designers are able to come up with interior designs using computer aided programs. They would turn out really nice and sleek which will encourage homeowners to get that certain design in actual. It is a nice way of presentation that will give clients a perfect view of how their space will look like after the project is done. That way, everything will be clear and detailed from the design to the materials as well as the layout. 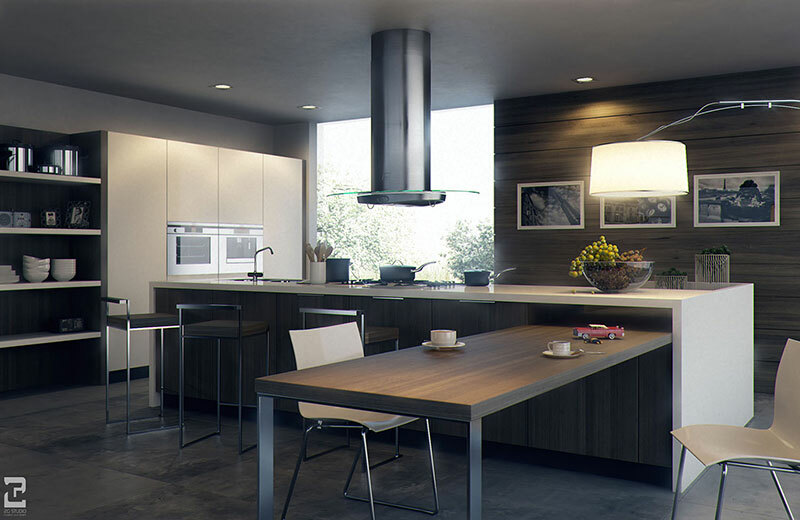 With that, we are going to feature some kitchen visualizations that you will surely like. 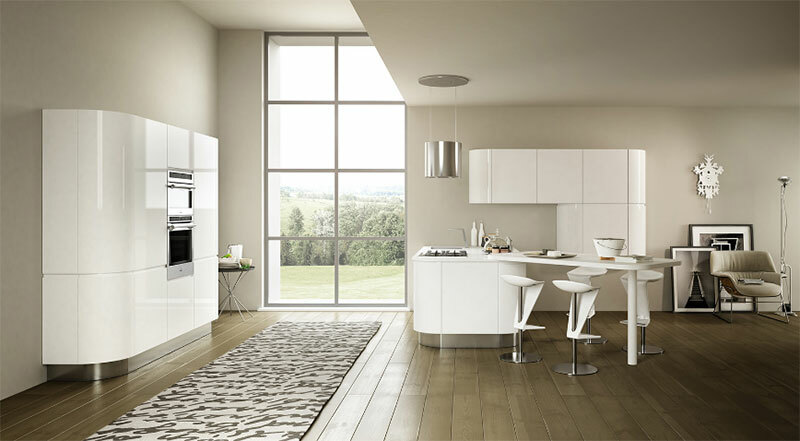 Of course, there are so many kitchen designs available around the web. But what we are going to have today are those with a masculine feel in it. We all know that there are homes occupied or owned by men. With that, they would prefer to add sleek manly designs in their spaces. Even if it doesn’t have the complicated and intricate designs that are usually seen in spaces for women, a masculine kitchen can still look really nice and visually appealing. Let us take a look at it through the images below. 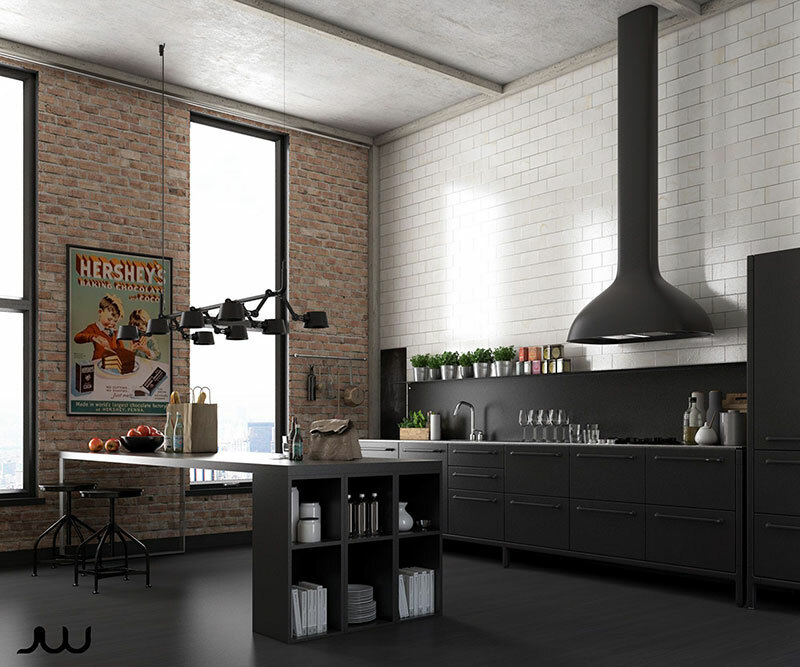 It is nice to see a modern kitchen with an industrial touch just like this. Notice that it is the brick walls that brought such feel while the rest look modern from the cabinets to the kitchen island which are all in gray color. 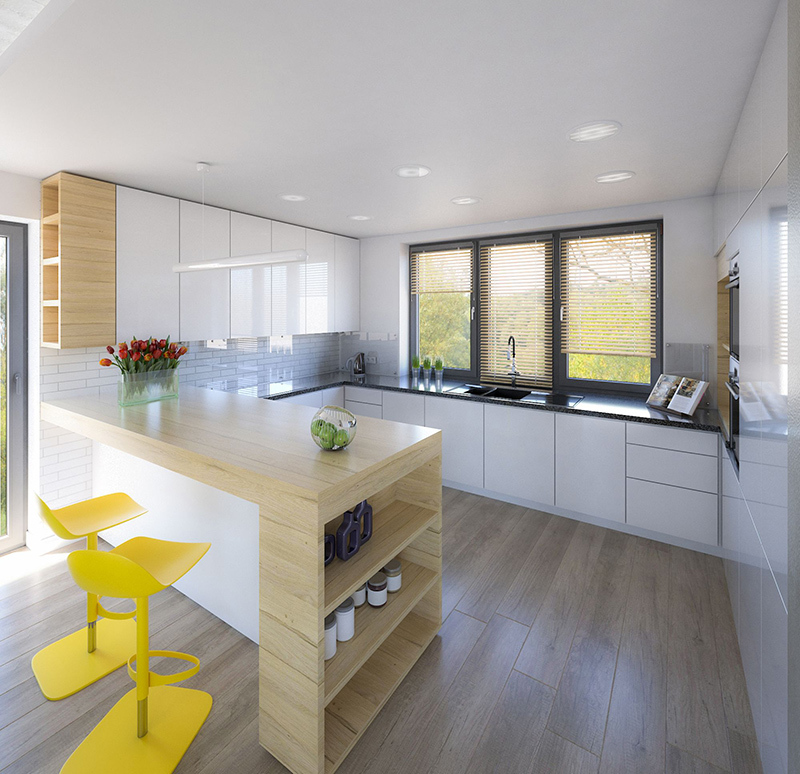 White is used for the kitchen’s walls and ceiling which made it appear spacious. It is also nice that wooden touches are used in it as well. What made it look even brighter is the glass floor to ceiling windows. 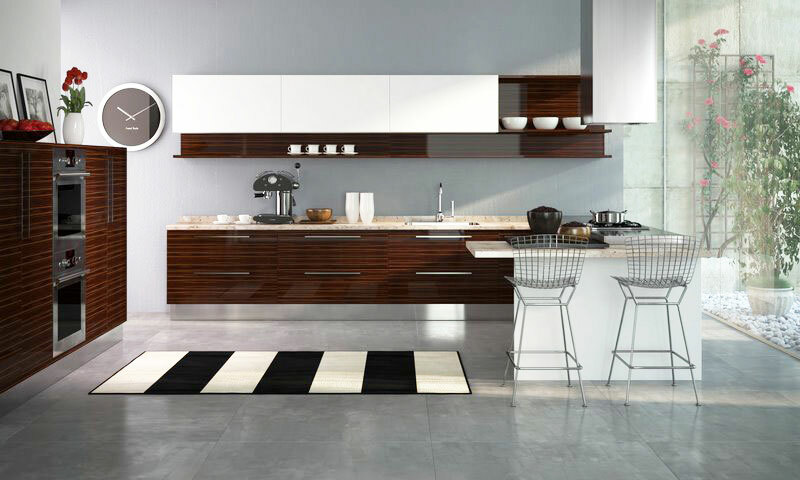 As usual, wood and white looks great together just like what is being used in this kitchen. I can tell that they are trying to conserve space with this design using merely a small two-seater kitchen counter. It also features an indoor garden as well. A simple kitchen which used white in most of its areas but what made this unique are the curvy elements seen in the cabinets and the island. The design of the island is nice too which has a subtle futuristic appeal on it. 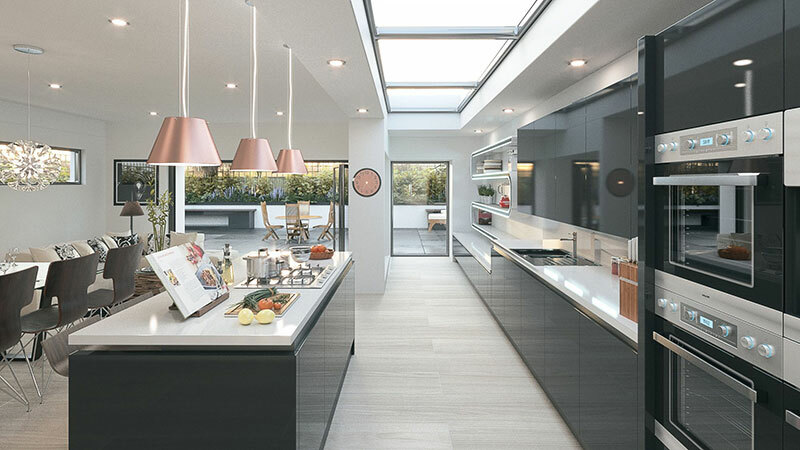 Although dark wood is used in this kitchen, it is illuminated with lighting fixtures as well as a large glass window. It is also nice that there are wall decors too. 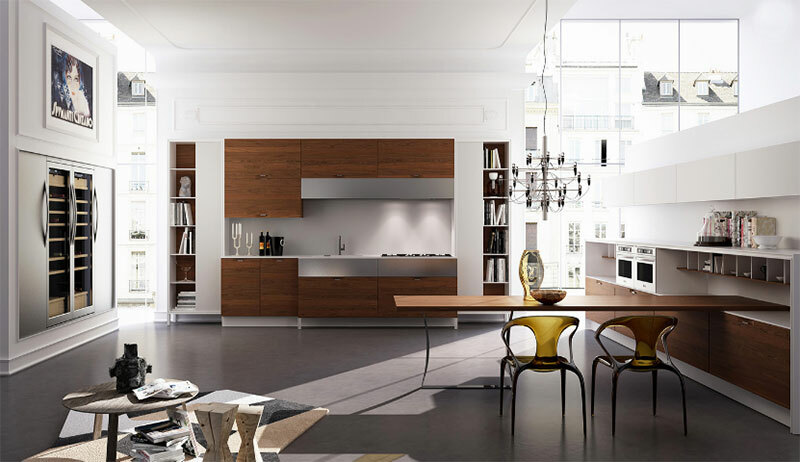 Now this is a spacious kitchen design wherein the kitchen island is parallel to the wall cabinets. Featured here are a skylight and a glass door that leads to an outdoor space. The contrast in this kitchen looks really beautiful. Isn’t it neat that black and white colors are used here? It is also nice that one side of the wall for the backsplash has some texture on it. 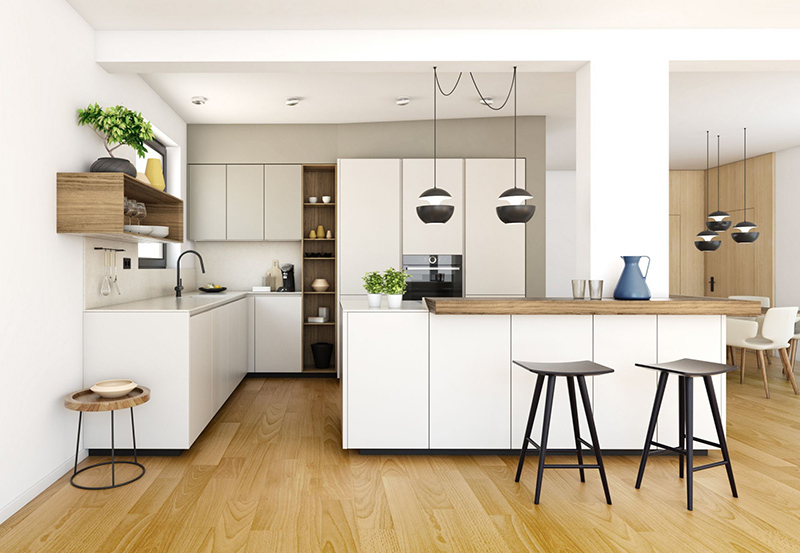 The primary color that will immediately get your attention here is white but you can also notice that there are wooden elements also from the flooring to the cabinets. I also find the lighting very interesting. 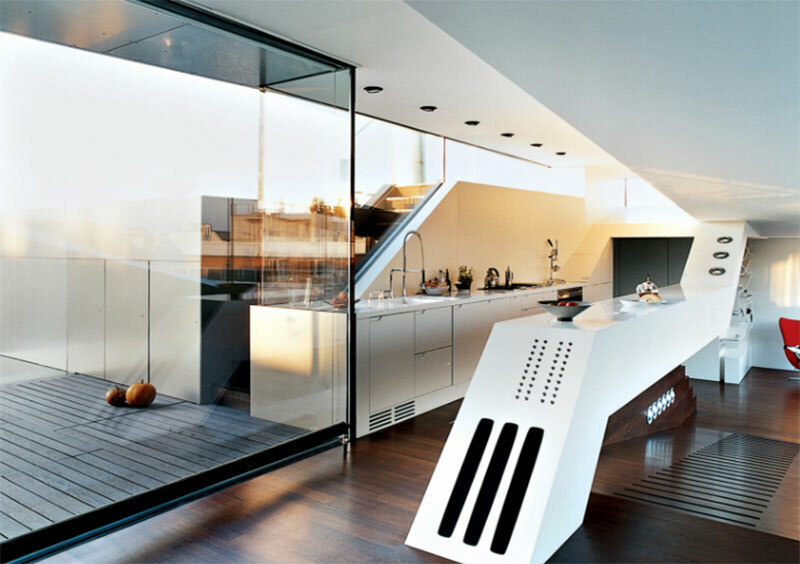 This kitchen has a unique angular counter which is definitely a centerpiece in this narrow penthouse kitchen. Its futuristic appeal is so impressive too. I always find a chandelier like that above the dining table very creative because of how different notes and quotes are being attached to it. A combination of white and wood is used for the cabinets and island in this kitchen. Wooden flooring is also used here while white tiles are used for the backsplash. The yellow chairs are nice accents too. I guess this one is for a condo or small apartment with a kitchen area on one side of the wall. There is a marble table in the dining space too. And you’d love the combination of gray and wood in here. 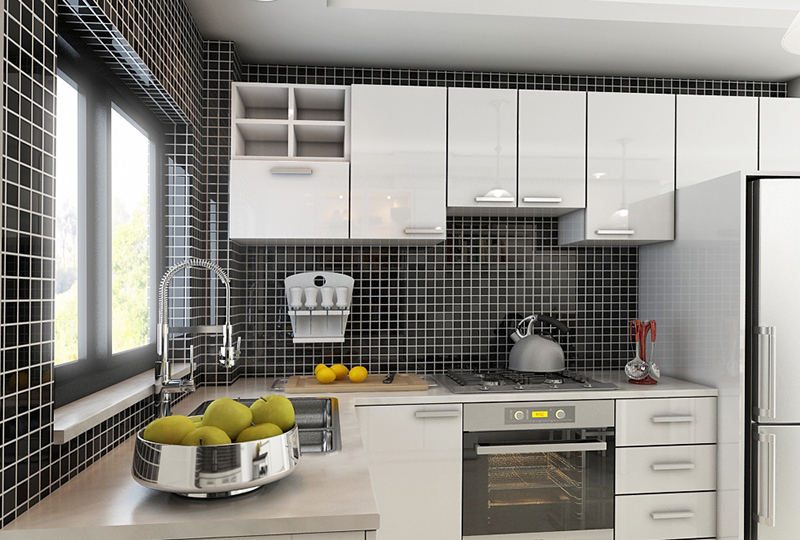 Don’t you just love the gray backsplash in this kitchen that also features black tiles. It matches well with the black countertop and wooden cabinets. And I love that pendant light in white and gold! 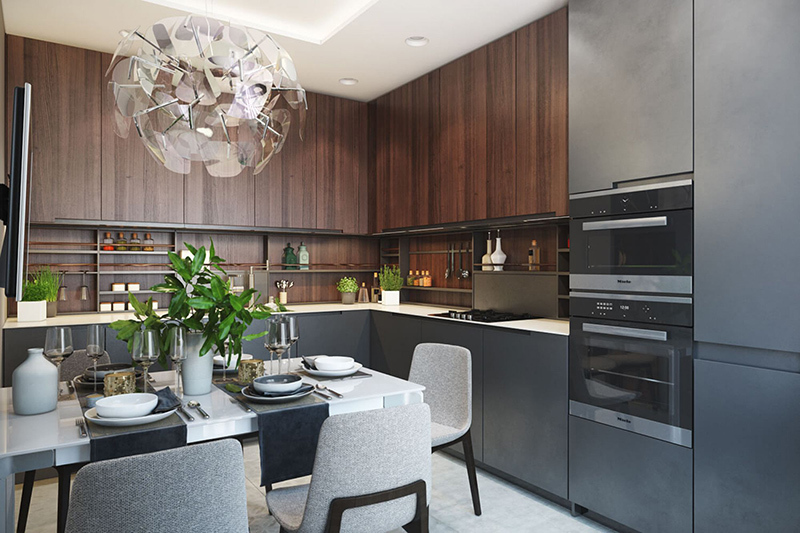 A white ceiling is just perfect for this masculine kitchen which has grays and wooden features in it. I also like it that there are plants in this area for a more refreshing appeal. You can see different textures in this kitchen and with its slightly dark tones, it does look really strong with a total manly feel. The lights are also very dramatic as well. 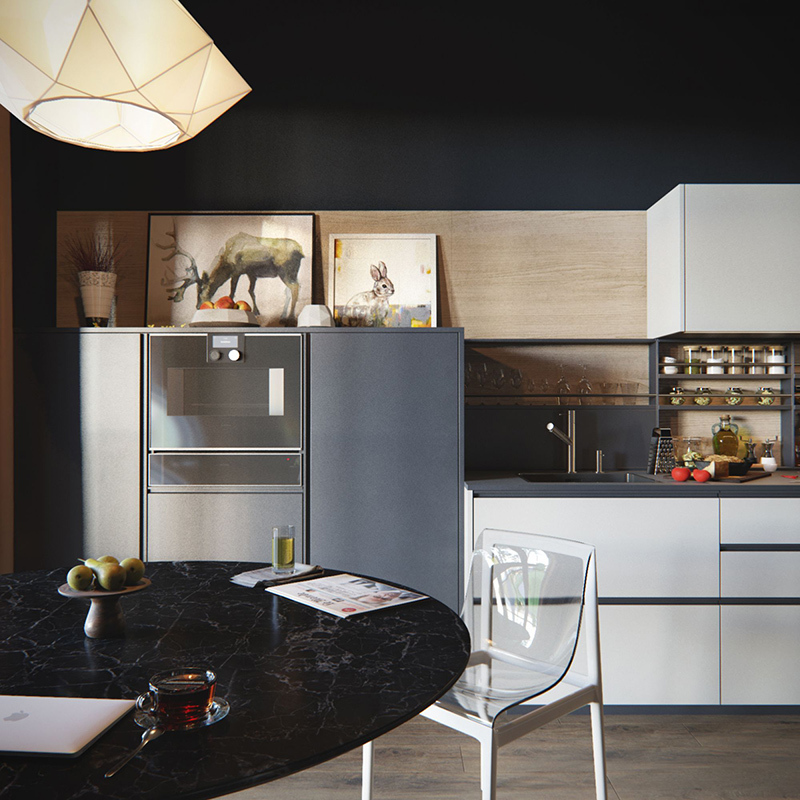 Don’t you like this black and white kitchen? I find the walls beautiful as it used black with white tile grout. Modern kitchen equipment is also used in here as well. 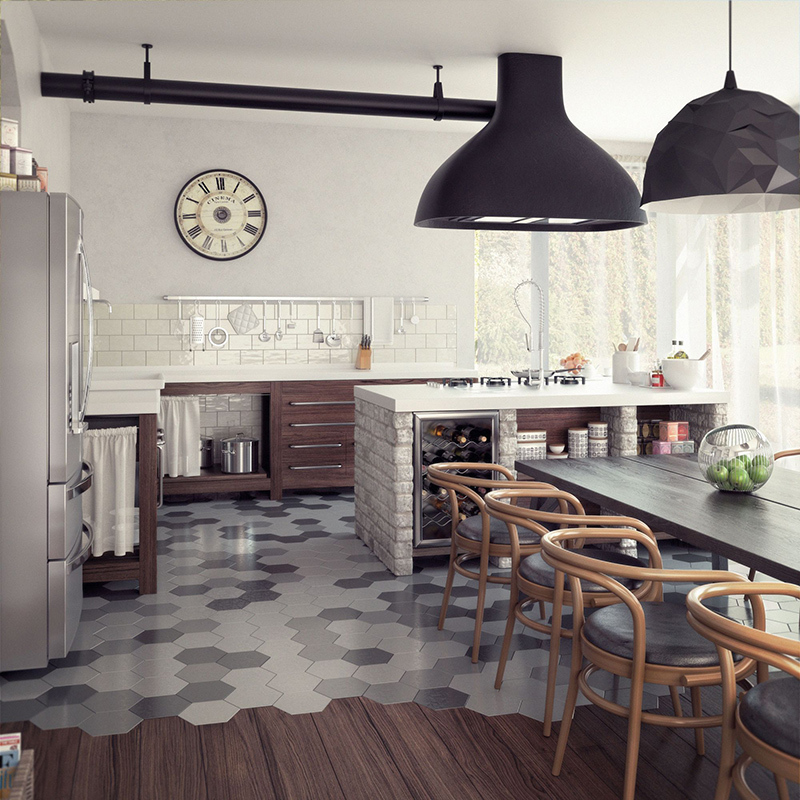 That huge clock made a difference in this kitchen as well as the lighting fixture and the flooring design. I also like it that aside from wood, brick stones are also used for the kitchen countertop. 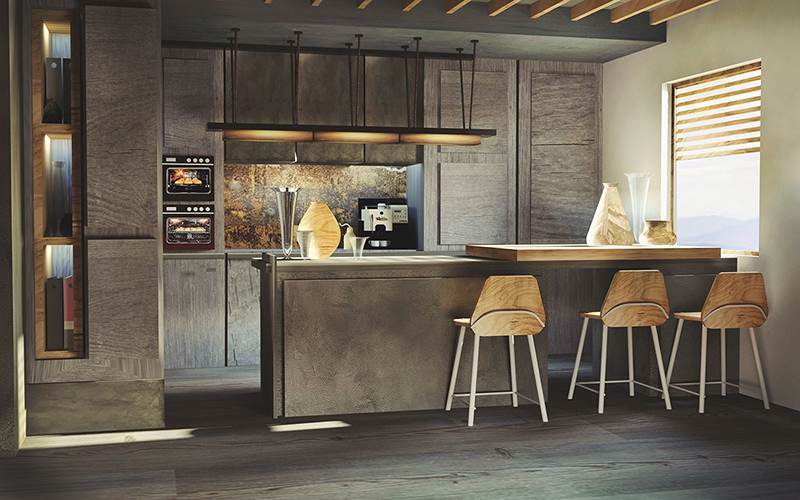 Wooden materials as well as the combination of gray and white are used in this kitchen. The kitchen island has a display area under it. 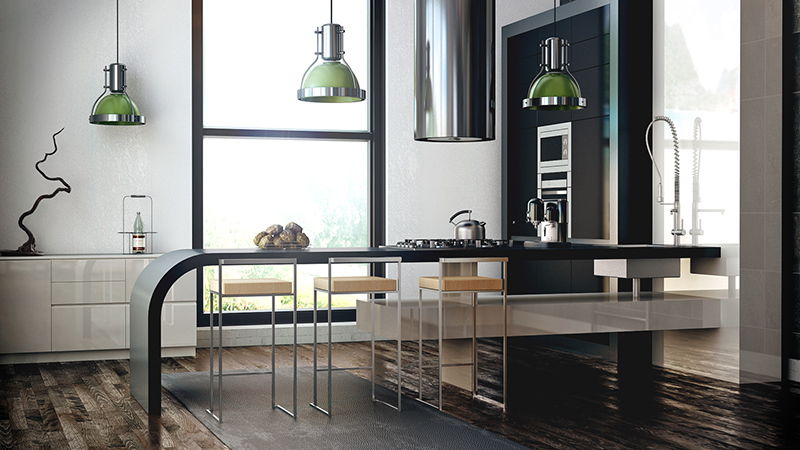 Just a simple design of a beautiful masculine kitchen that used green industrial lights. 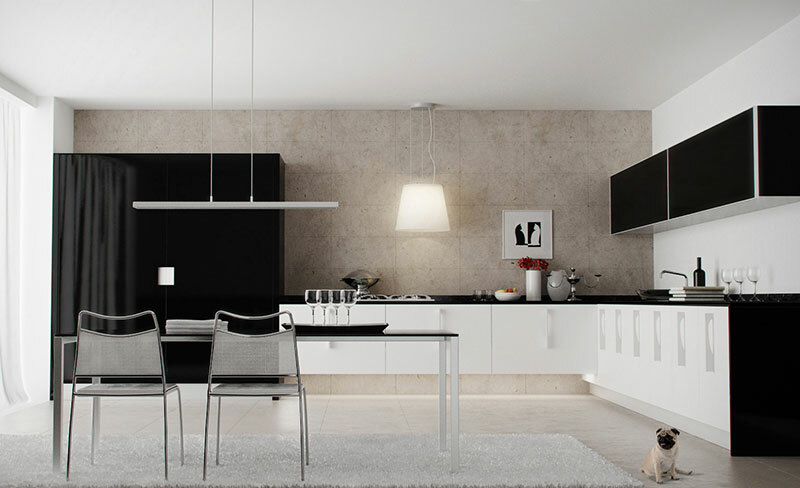 Notice that it has wooden flooring and cabinets that come in white and black. 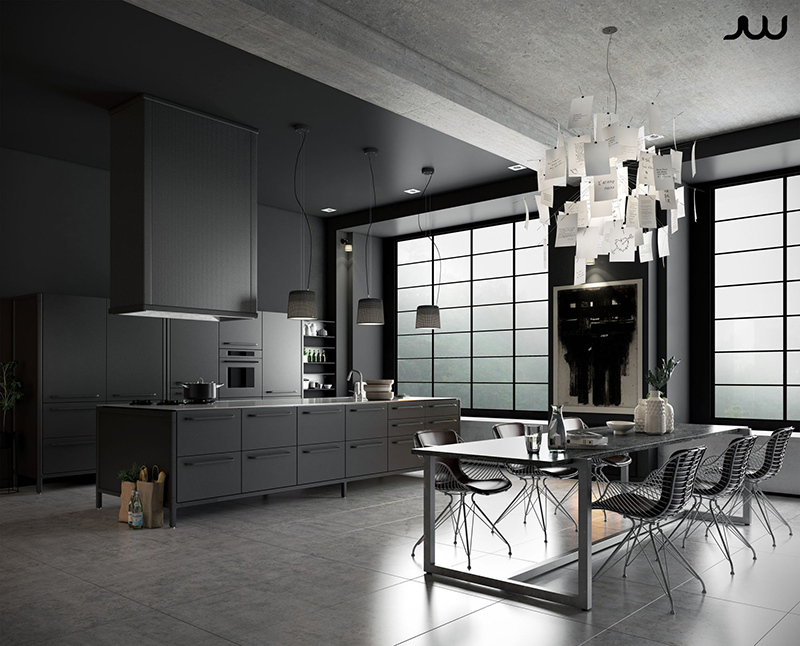 Anyone who loves gray would love this kitchen. It does look hi-tech because of the items in it. To add some soft touch to it, chairs with curves were added for the kitchen counter. I am sure that you liked what you saw because they all look very nice indeed. 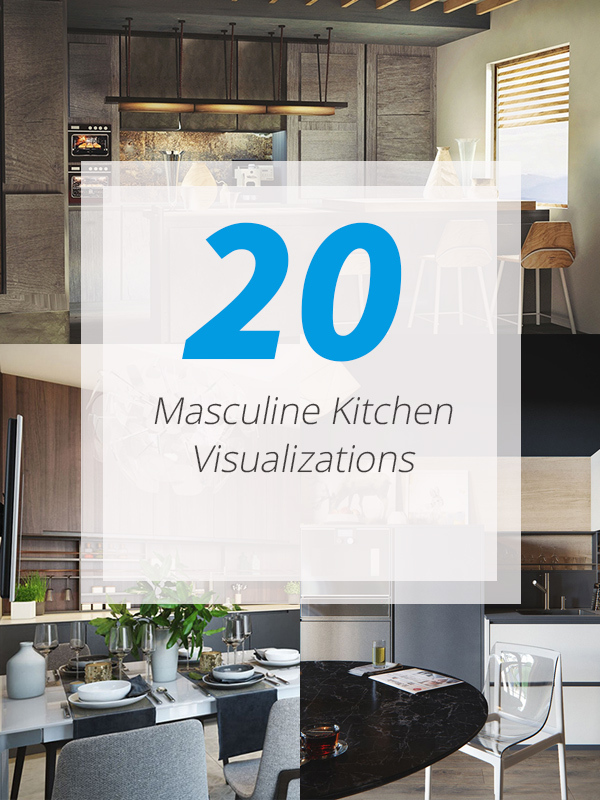 The masculine kitchen visualizations you have seen will surely give ideas to those who would like to have a kitchen that has a strong appeal yet not overly done. Don’t you like the designs above? 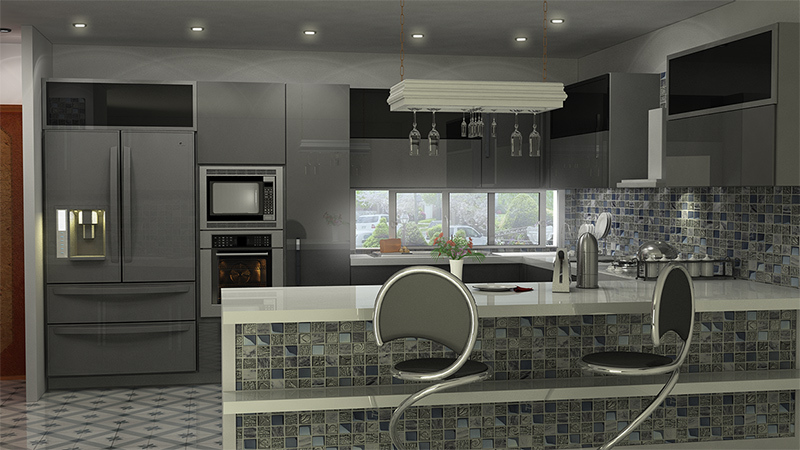 Know someone who is looking for kitchen designs for the homes, apartments or condo spaces? This round up is a great source of design inspiration for them. Can you tell me which of the above kitchens you like the most?